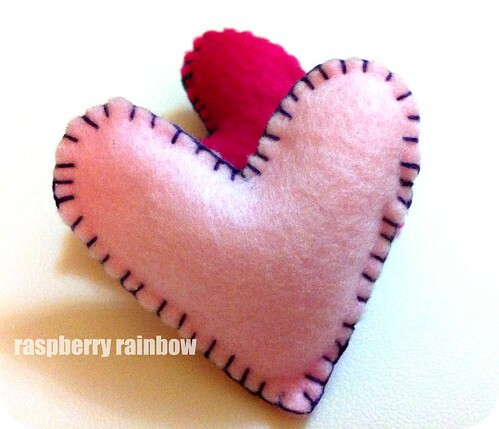 Tonight I have been stitching some little felt hearts. I felt (haha) that we needed some home made loveliness after we had an eventful afternoon. Abbey's dear friend from kinder fell over while running, split her head open and we saw it all happen. There was so much blood as it was her temple and she did need a hospital visit and stitches. Abbey was very concerned for her friend. You make me think I might have to get out some felt and make a few things with it myself! :) Very cute hearts! A little kindness to heal the hurts of the day...lovely! she's such a caring little thing. The hearts are lovely. I remember when I was six and my dad made me a three house and he lost the hammer right onto my forehead. That was quite bloody, and I was terrified but it all went fine. So sweet! Glad her friend is ok.